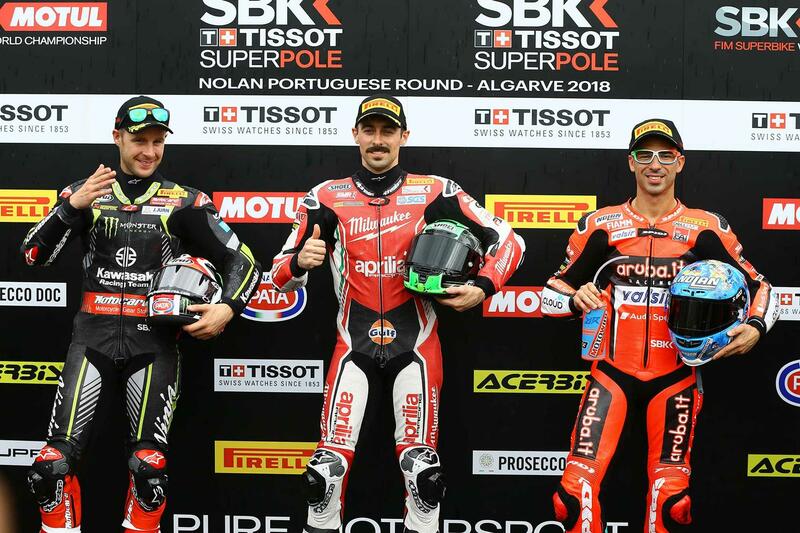 Eugene Laverty has stormed to a third WSB career pole position and his first in five years, seeing off championship leader Jonathan Rea by just 0.060 seconds in Portimao. With a lap time of 1:40.705, Laverty bagged the top spot in the closing stages of Superpole 2, giving Aprilia their first pole position in the class for three years and smashing the existing qualifying lap record – a 1:41.360 set by Kawasaki’s Tom Sykes in 2013. Second place man Rea was followed home by Marco Melandri, who finished the session 0.091 seconds down on the three-time world champion aboard his Ducati Panigale R machine and 0.151 seconds behind the pole man. Teammate and second in the championship, Chaz Davies, could only manage 14th place on the grid, after being bumped out of contention for Superpole 2 by Gulf Althea BMW’s Loris Baz and Red Bull Honda’s Leon Camier. 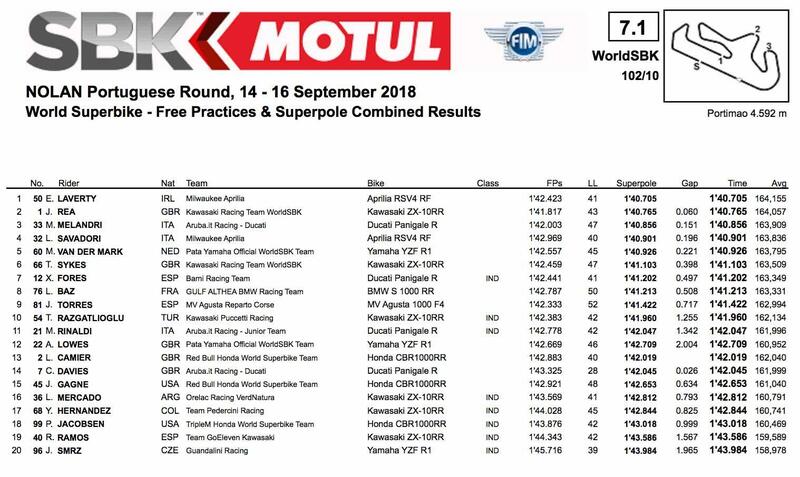 Finishing the session in fourth place was the other Milwaukee Aprilia of Lorenzo Savadori, who set the early pace in the second qualifying session after graduating from Superpole 1 fastest, with a lap time of 1:41.457. Following him was the first of the Pata Yamahas, piloted by Michael van der Mark, with a best time of 1:40.926. His teammate Alex Lowes ended the second session slowest, managing a 1:42.709 before crashing out at turn 15 late on in the proceedings. He will start today's race from 12th on the grid.